Tag Archives: Fitzhugh L. Fulton Jr.
18 February 1977: The prototype space shuttle orbiter Enterprise (OV-101) made its first captive flight aboard NASA 905, the Boeing 747-123 Shuttle Carrier Aircraft. On this flight, no one was aboard Enterprise. 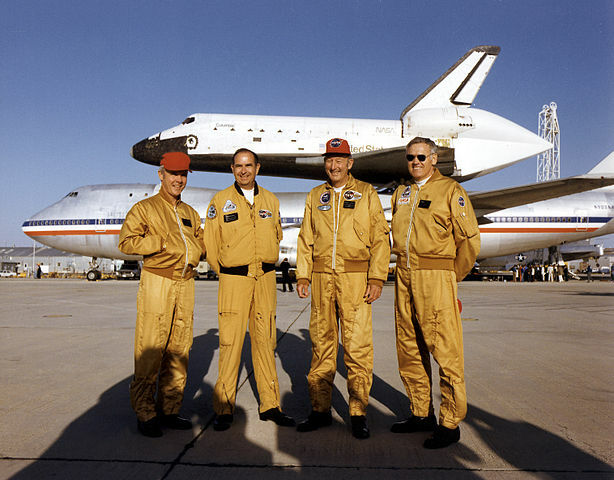 NASA 905 was flown by Aircraft Commander Fitzhugh L. Fulton, Jr., Pilot Thomas C. McMurty, and Flight Engineers Louis E. Guidry, Jr. and Victor W. Horton. The duration of the first captive flight was 2 hours, 5 minutes. The Enterprise/SCA combination reached a maximum speed of 287 miles per hour (462 kilometers per hour) and altitude of 16,000 feet (4,877 meters). The Space Shuttle prototype Enterprise rides smoothly atop NASA’s first Shuttle Carrier Aircraft (SCA), NASA 905, during the first of the shuttle program’s Approach and Landing Tests (ALT) at the Dryden Flight Research Center, Edwards, California, in 1977. 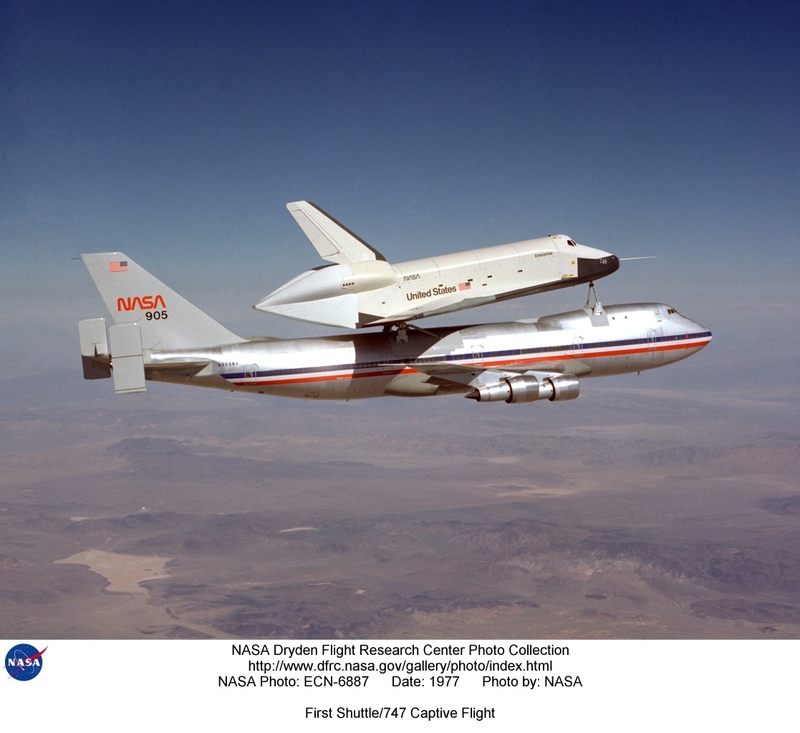 During the nearly one year-long series of tests, Enterprise was taken aloft on the SCA to study the aerodynamics of the mated vehicles and, in a series of five free flights, tested the glide and landing characteristics of the orbiter prototype. In this photo, the main engine area on the aft end of Enterprise is covered with a tail cone to reduce aerodynamic drag that affects the horizontal tail of the SCA, on which tip fins have been installed to increase stability when the aircraft carries an orbiter. NASA 905 (the airplane’s call sign is based on its FAA registration, N905NA) was originally built by Boeing for American Airlines as a 747-123 airliner, serial number 20107. It was delivered to American 29 October 1970 with the registration N9668. 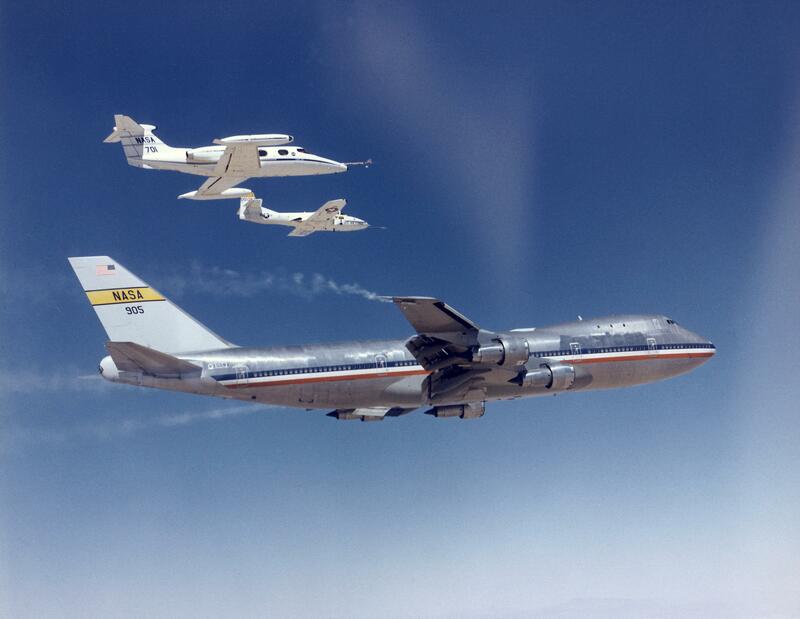 NASA acquired the airliner 18 July 1974 for use in wake vortex studies. 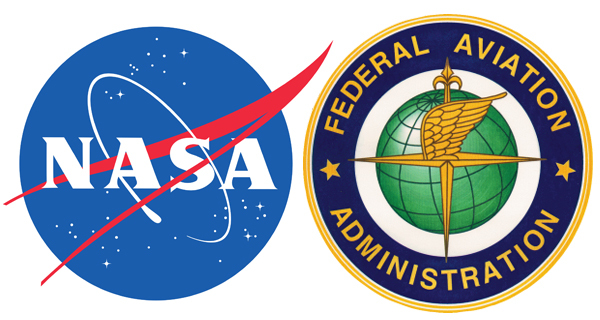 Modification to the SCA configuration began in 1976. Most of the interior was stripped and the fuselage was strengthened. Mounting struts for the space shuttle were added and end plates for additional stability were attached to the horizontal tail plane. 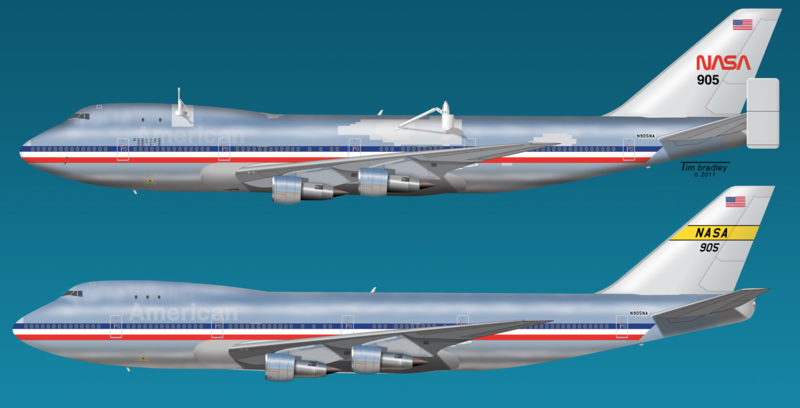 The 747 retained the red, white and blue horizontal stripes of American Airlines’ livery until the early 1980s. 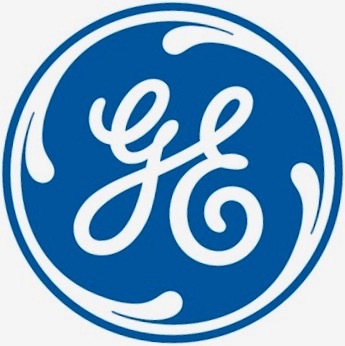 The standard Pratt & Whitney JT95-3A high bypass ratio turbofan engines were upgraded to JT9D-7J turbofans. This increased thrust from 46,950 pounds to 50,000 pounds (222.41 kilonewtons) each. The JT9D-7J is a two-spool, axial-flow turbofan engine with a single stage fan section, 14-stage compressor section and 4-stage turbine. This engine has a maximum diameter of 7 feet, 11.6 inches (2.428 meters), is 12 feet, 10.2 inches (3.917 meters) long and weighs 8,850 pounds (4,014 kilograms). This image shows NASA 905 as configured for wake vortex studies and as a Shuttle Carrier Aircraft. Artwork courtesy of Tim Bradley Imaging. NASA 905 is 231 feet, 10.2 inches (70.668 meters) long with a wingspan of 195 feet, 8 inches (59.639 meters) and overall height of 63 feet, 5 inches (19.329 meters). Its empty weight is 318,053 pounds (144,266 kilograms) and maximum takeoff weight is 710,000 pounds (322,050 kilograms). 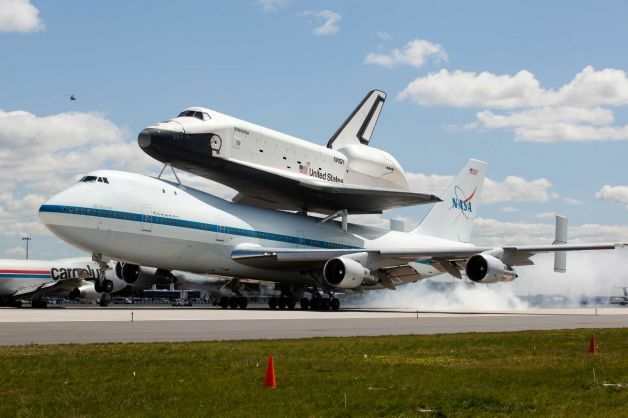 While carrying a space shuttle, the SCA maximum speed is 0.6 Mach (443 miles per hour, or 695 kilometers per hour). The service ceiling is 15,000 feet (4,572 meters) and its range is 1,150 miles (1,850.75 kilometers). NASA 905 is displayed at Independence Park at Space Center Houston, a science and space learning center in Houston, Texas. 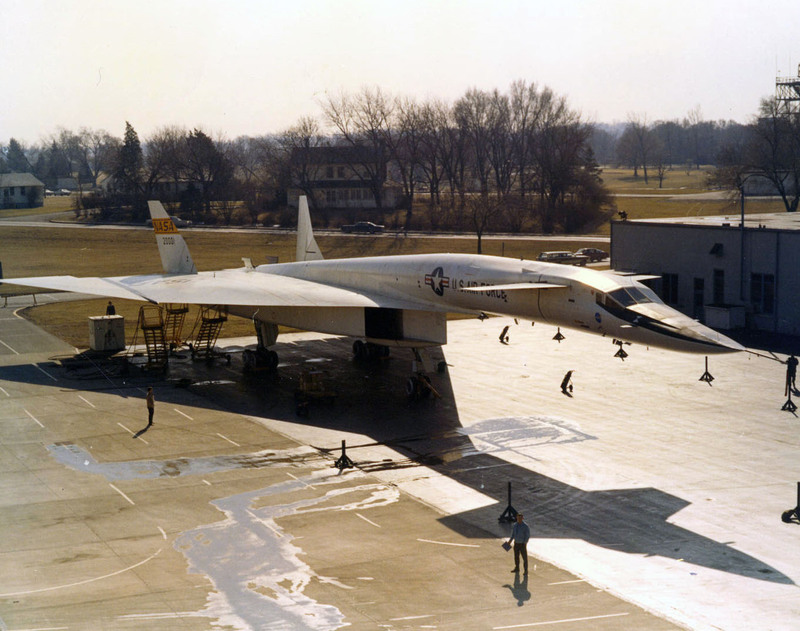 4 February 1969: The North American Aviation XB-70A-1-NA Valkyrie, 62-0001, made its very last flight from Edwards Air Force Base, California, to Wright-Patterson Air Force Base, Ohio. 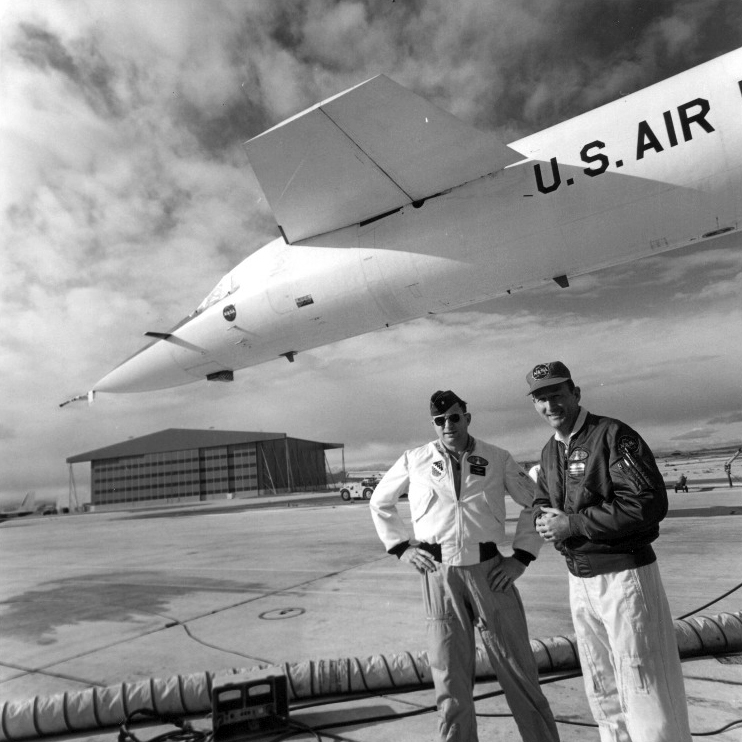 NASA Research Test Pilot Fitzhugh L. Fulton, Jr., Lieutenant Colonel, U.S. Air Force (Retired), and Lieutenant Colonel Emil Sturmthal, U.S. Air Force, were the flight crew for this final flight. On arrival at Wright-Patterson, Fulton closed out the log book and handed it over to the curator of the National Museum of the United States Air Force. 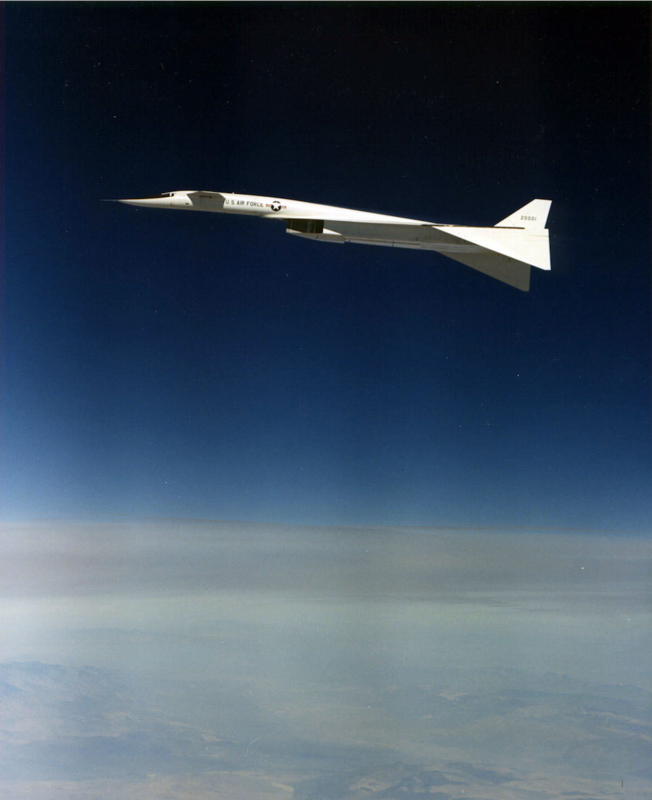 The Mach 3+ prototype strategic bomber and high-speed, high-altitude research airplane had completed 83 flights for a total of 160 hours, 16 minutes of flight time. 62-0001 was the first of three prototype Mach 3+ strategic bombers. (The third prototype, XB-70B 62-0208, was not completed.) The Valkyrie utilized the most advanced technology available. Materials and manufacturing techniques had to be developed specifically to build this airplane. It is a large delta wing airplane with a forward canard and two vertical fins. The outer 20 feet (6.096 meters) of each wing could be lowered to a 25° or 65° angle for high speed flight. Although this did provide additional directional stability, it actually helped increase the compression lift, which supported up to 35% of the airplane’s weight in flight. The XB-70A is 185 feet, 10 inches (56.642 meters) long with a wingspan of 105 feet (32.004 meters) and overall height of 30 feet, 9 inches (9.373 meters). Fully loaded, the Valkyrie weighs 534,700 pounds (242,535 kilograms). It is powered by six General Electric YJ93-GE-3 turbojet engines which were rated at 22,000 pounds of thrust (97.86 kilonewtons) at Sea Level, and 31,000 pounds (137.89 kilonewtons) with afterburner. The J93 was a single-shaft axial-flow turbojet with an 11-stage compressor section and two-stage turbine. It was 235.0 inches (5.969 meters) long, 55.0 inches (1.397 meters) in diameter, and weighed 4,770 pounds (2,164 kilograms). The maximum speed achieved was Mach 3.1 (2,056 miles per hour, or 3,308.8 kilometers per hour) at 73,000 feet (22,250 meters). The service ceiling is 73,350 feet (23,357 meters). The second Valkyrie, XB-70A-2-NA 62-0207, was destroyed when it crashed after a mid-air collision with a Lockheed F-104N Starfighter flown by NASA Chief Research Test Pilot Joseph A. Walker, 8 June 1966. Both Walker and the B-70’s co-pilot, Major Carl S. Cross, U.S. Air Force, were killed. XB-70A Valkyrie 62-0001 is in the collection of the National Museum of the United States Air Force. 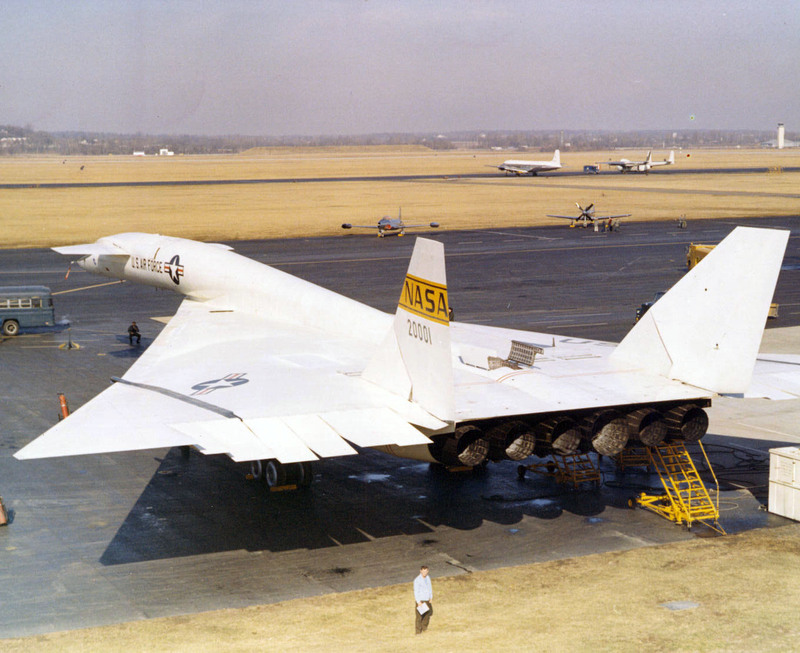 North American Aviation XB-70A-1-NA Valkyrie 62-0001 at Wright-Patterson Air Force Base, Ohio. 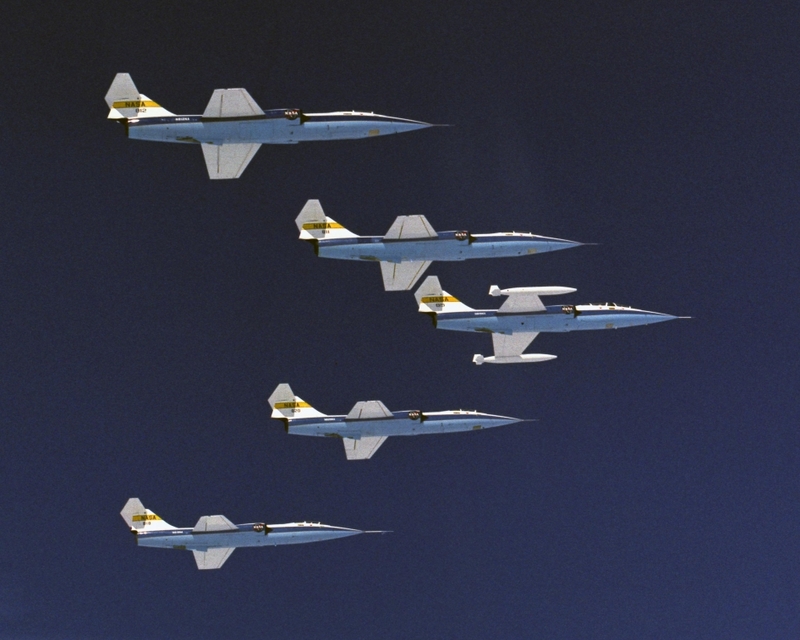 This photograph shows the twelve elevons that act as elevators, flaps and ailerons, the swiveling action of the vertical fins, open drag chute doors and the variable exhaust outlets. (U.S. Air Force). 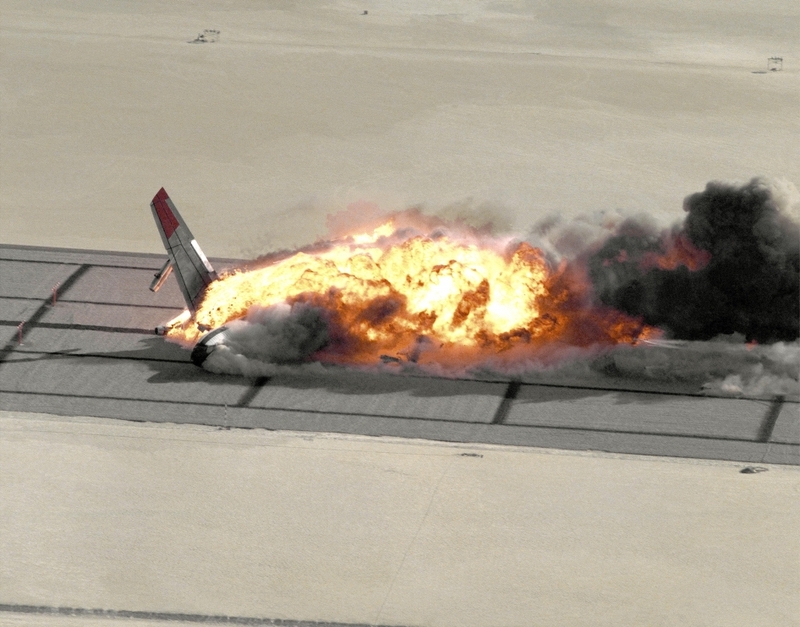 After four years of planning and preparation, the National Aeronautics and Space Administration (NASA) and the Federal Aviation Administration (FAA) intentionally crashed a Boeing 720 airliner to test an experimental fuel additive intended to reduce post-crash fires, and to assess passenger survivability. An anti-misting agent was added to standard commercial JP-5 jet fuel to create AMK, or “Anti-Misting Kerosene.” The airliner’s fuel tanks were filled with the AMK mixture, totaling 16,060 gallons (10,794 liters). 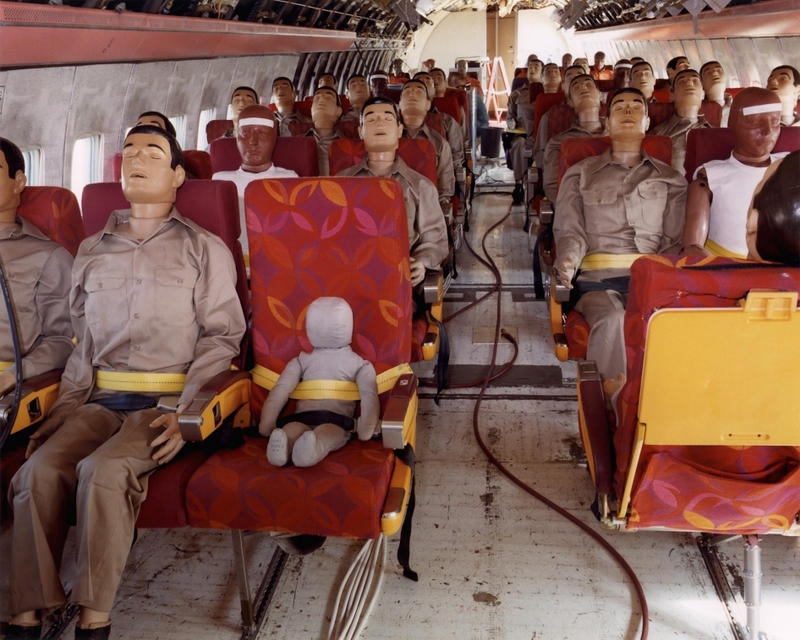 Instrumented crash test dummies were placed in the passengers seats. NASA 833, the Boeing 720-027 airliner, FAA registration N833NA, was a remotely-piloted aircraft. NASA test pilot Fitzhugh Lee (“Fitz”) Fulton, Jr., flew NASA 833 from a ground station, the NASA Dryden Remotely Controlled Vehicle Facility. 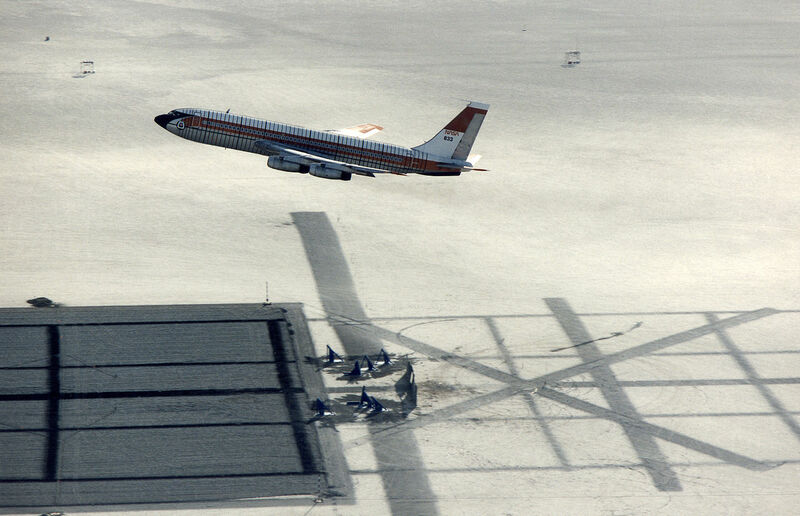 More than 60 flights had been made prior to the actual test. 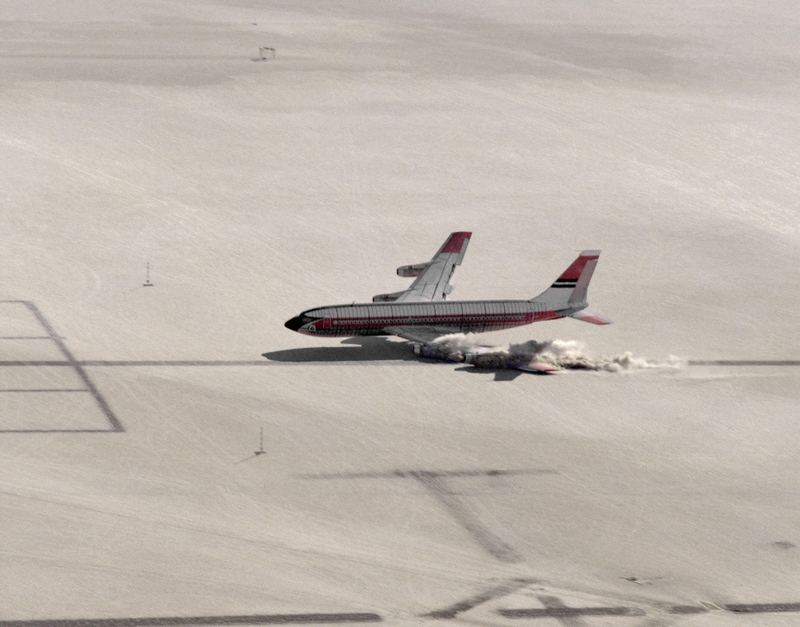 The test was planned so that the airliner would make a shallow 3.8° approach to a prepared runway on the east side of Rogers Dry Lake at Edwards Air Force Base. It was to land on its belly in a wings-level attitude, then slide into a group of barriers, called “rhinos,” which would slice open the wing tanks. The fuselage and passenger cabin would remain intact. NASA and the FAA estimated that this would be “survivable” for all occupants. As the Boeing 720 descended on its Final Approach, its nose yawed to the right and the airplane went to the right of the runway center line. It then yawed back to the left and entered an out-of-phase oscillation called a “Dutch roll.” The decision height to initiate a “go-around” was 150 feet (45.7 meters) above the surface of the lake bed. 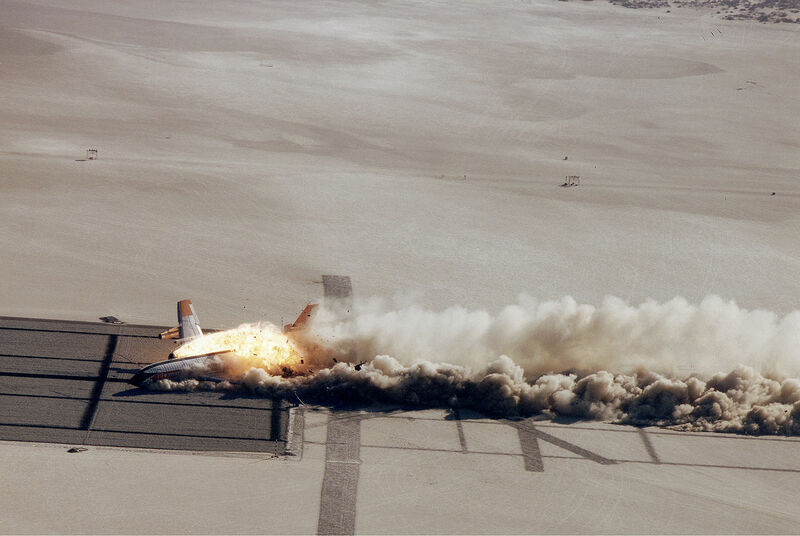 Fitz Fulton thought he had enough time to get NASA 833 back on the center line and committed to the test landing. However, the Dutch roll resulted in the airliner’s left wing impacting the ground with the inboard engine on the left wing (Number Two) just to the right of the center line. According to the test plan, all four of the airliner’s engines should have been brought to idle, but they remained at full throttle. The left wing’s impact yawed the airliner to the left and, rather than the fuselage passing through the rhino barriers undamaged, the passenger compartment was torn open. Another rhino sliced into the Number Three engine (inboard, right wing), opening its combustion chamber. With the fuel tanks in the wings ruptured, raw fuel was sprayed into the engine’s open combustion chamber which was still at full throttle. The raw fuel ignited and exploded into a fireball. Flames immediately entered the passenger compartment. As the 720 slid on the runway it continued to rotate left and the right wing broke off though the fuselage remained upright. As the right wing came off the ruptured fuel tanks emptied most of the raw fuel directly into the fireball. Over an hour was required to extinguish the flames. 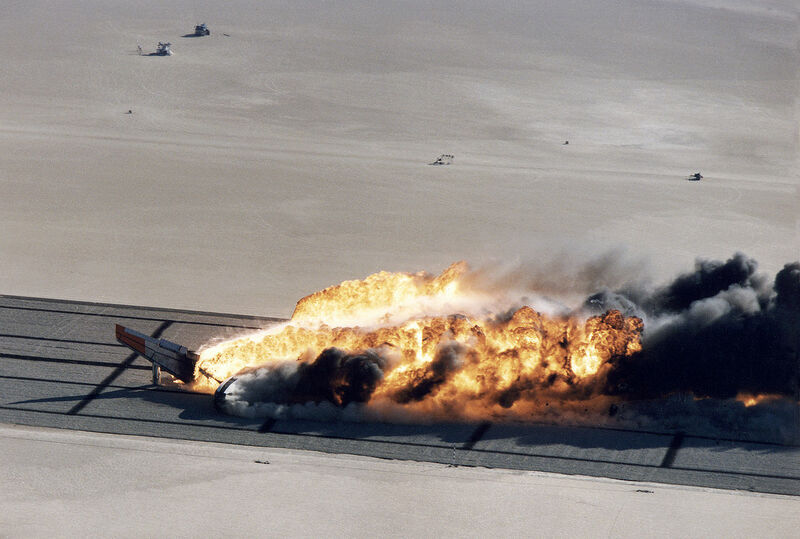 The test of the flame-reducing fuel additive was a complete failure. Test engineers estimated that 25% of the occupants might have survived the crash, however, it was “highly speculative” that any could have escaped from the burning, smoke-filled passenger compartment. Fitzhugh Lee Fulton, Jr., was born at Blakely, Georgia, 6 June 1925, the first of two sons of Fitzhugh Lee Fulton, a merchant seaman, and Manila Fulton. 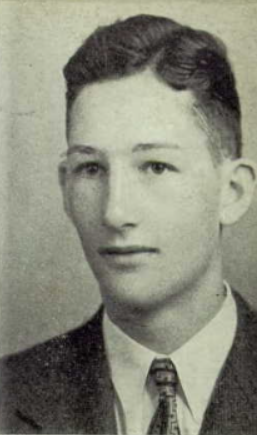 He attended Columbus High School, Columbus Georgia, graduating in 1942. He entered College at Alabama Polytechnic Institute (now known as Auburn University) and the University of Oklahoma. He was awarded a bachelor of arts degree from Golden Gate University, San Francisco, California. Fulton entered the U.S. Army Air Corps in 1943, and was trained as a pilot. He married Miss Erma I. Beck at Tucson, Arizona, 16 December 1945. They would have three children. Following World War II, participated in Operation Crossroads, the atomic bomb tests at Bikini Atoll, July 1946. Lieutenant Fulton flew the Douglas C-54 Skymaster four-engine transport during the Berlin Airlift, making 225 sorties, and then the Douglas B-26 Invader light attack bomber during the Korean War. At Edwards Air Force Base, he flew the B-52 “mother ships” for the X-15 Program. He flew the North American XB-70A Valkyrie faster than Mach 3. 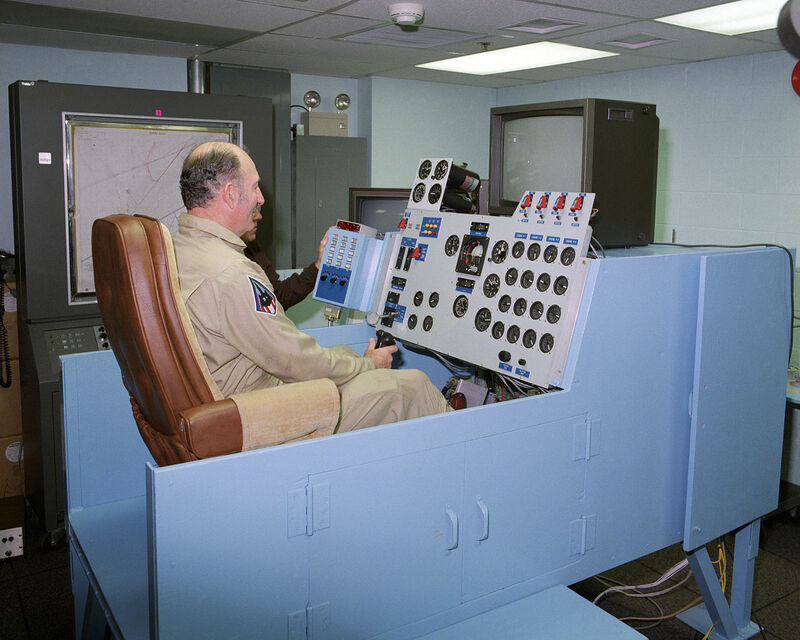 When Fulton retired from the Air Force in 1966, he was a lieutenant colonel assigned as Chief of Bomber and Transport Test Operations. 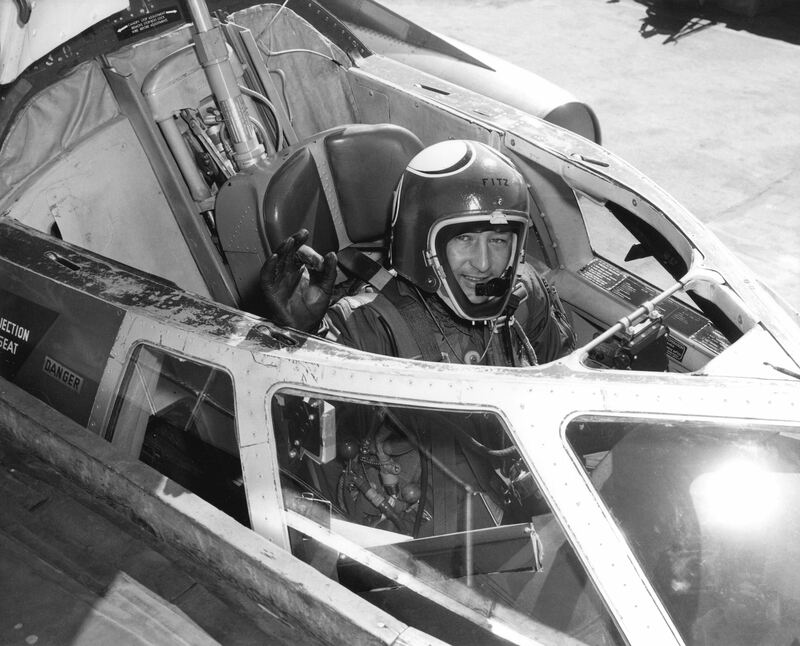 Fitz Fulton continued as a research test pilot for NASA, flying as project pilot for the YF-12A and YF-12C research program. 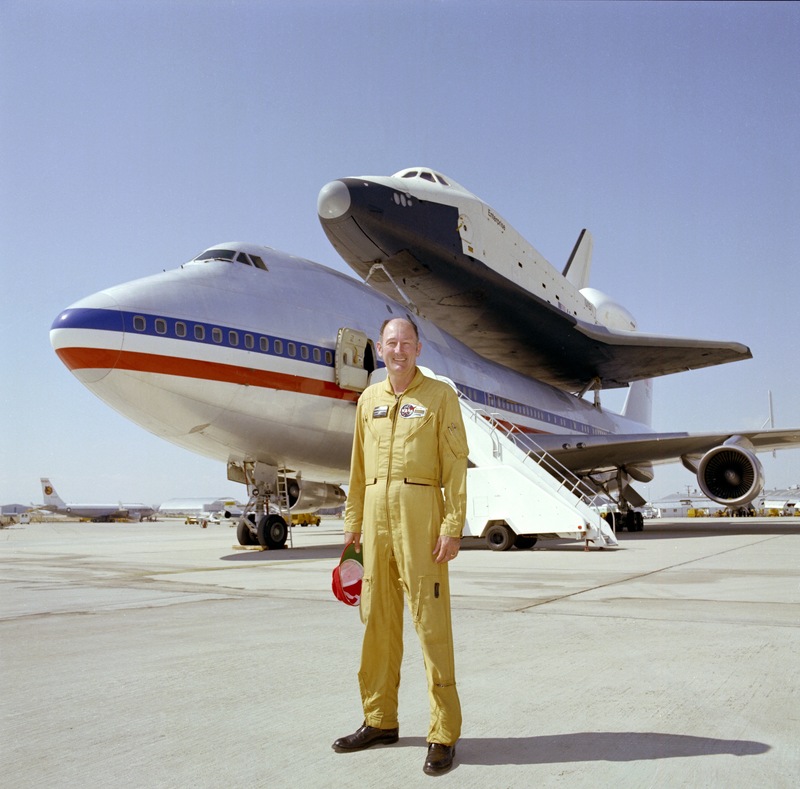 He flew all the early test flights of the NASA/Boeing 747 Shuttle Carrier Aircraft and carried the space shuttle prototype, Enterprise. By the time he had retired from NASA, Fulton had flown more than 16,000 hours in 235 aircraft types. Fitzhugh L. Fulton, Jr., died at Thousand Oaks, California, 4 February 2015, at the age of 89 years.. 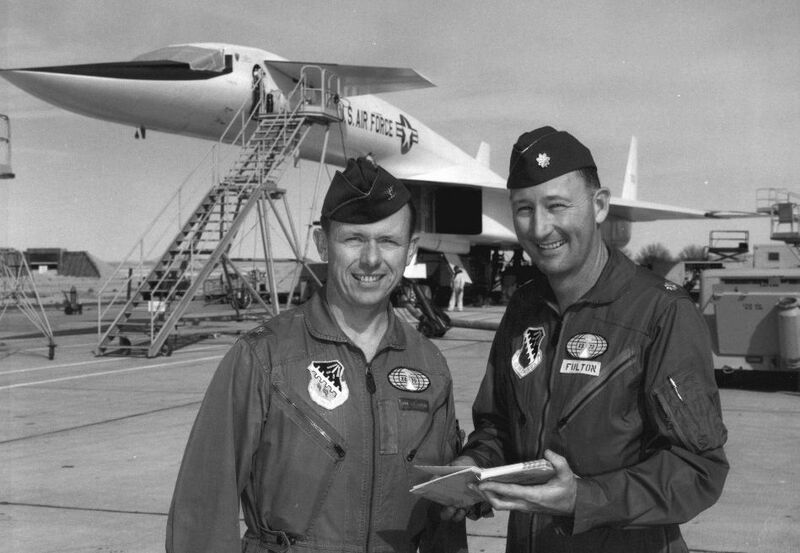 Colonel Joseph Frederick Cotton and Lieutenant Colonel Fitzhugh Lee Fulton, Jr., with a North American Aviation XB-70A Valkyrie. NASA 833 (c/n 18066) was ordered by Braniff Airways, Inc., as N7078, but the sale was not completed. 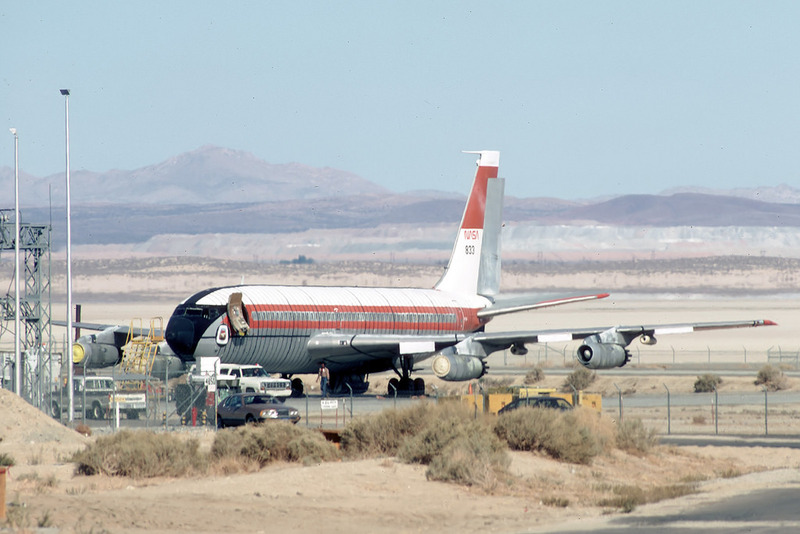 The airplane first flew 5 May 1961 and it was delivered to the Federal Aviation Administration as a test aircraft one week later, 12 May 1961, registered N113. A few years later the identification was changed to N23, then back to N113, and then once again to N23. 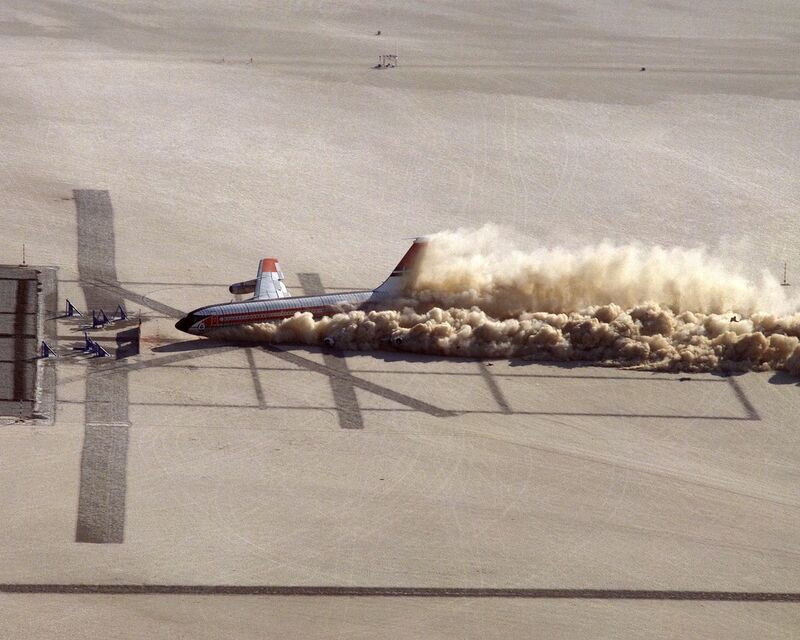 In 1982, the Boeing 720 was transferred to NASA to be used in the Controlled Impact Demonstration. At this time it was registered as N2697V. A final registration change was made to N833NA. 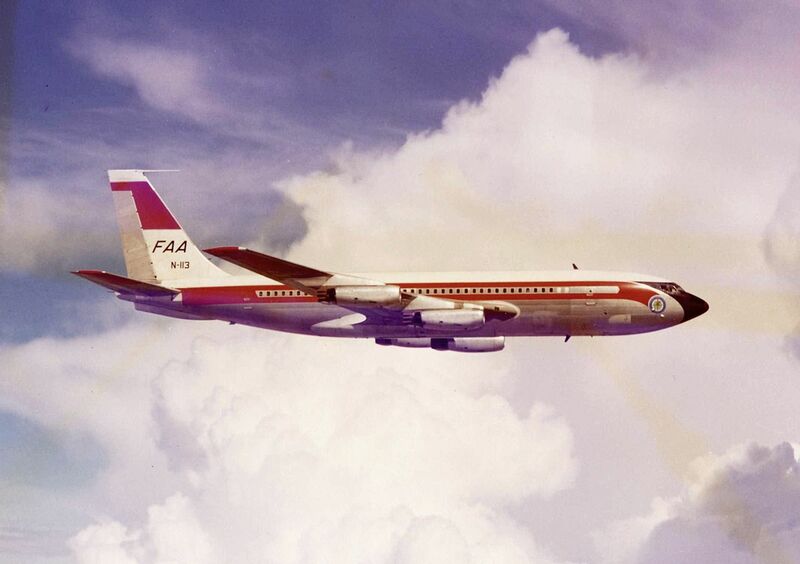 The Boeing 720 was a variant of the Model 707, intended for short to medium range flights. It had 100 inches (2.54 meters) removed from the fuselage length and improvements were made to the wing, decreasing aerodynamic drag, though it retained the span of the 707. The Boeing 720 was powered by four Pratt & Whitney Turbo Wasp JT3C-7 turbojet engines, a civil variant of the military J57 series. The 720B was equipped with the more efficient P&W JT3D-1 turbofan engines. The JT3C-7 was a “two-spool” axial-flow engine with a 16-stage compressor (9 low- and 7 high-pressure stages), 8 combustion tubes, and a 3-stage turbine (1 high- and 2 low-pressure stages). It was rated at 12,030 pounds of thrust (53.512 kilonewtons) for takeoff. The JT3D-1 was a dual axial-flow turbofan engine, with a 2-stage fan section 13-stage compressor (6 low- and 7 high pressure stages), 8 combustion chambers and a 4-stage turbine (1 high- and 3 low-pressure stages). This engine was rated at 14,500 pounds of static thrust (64.499 kilonewtons) at Sea Level, and 17,000 pounds (75.620 kilonewtons), with water injection, for takeoff (2½ minute limit). Almost half of the engine’s thrust was produced by the fans. Maximum engine speed was 6,800 r.p.m. (N1) and 10,200 r.p.m. (N2). It was 11 feet, 4.64 inches (3.471 meters) long, 4 feet, 5.00 inches (1.346 meters) wide and 4 feet, 10.00 inches (1.422 meters) high. It weighed 4,165 pounds (1,889 kilograms). The JT3C could be converted to the JT3D configuration during overhaul. The maximum cruise speed of the Boeing 720 was 611 miles per hour (983 kilometers per hour) and maximum speed was 620 miles per hour (1,009 kilometers per hour). The range at at maximum payload was 4,370 miles (7,033 kilometers). Boeing built 154 720 and 720B airliners from 1959 to 1967.